Yesterday we had a full day skiing, but in mostly poor weather. Lots of low cloud and flat light. Today was bright but windy. 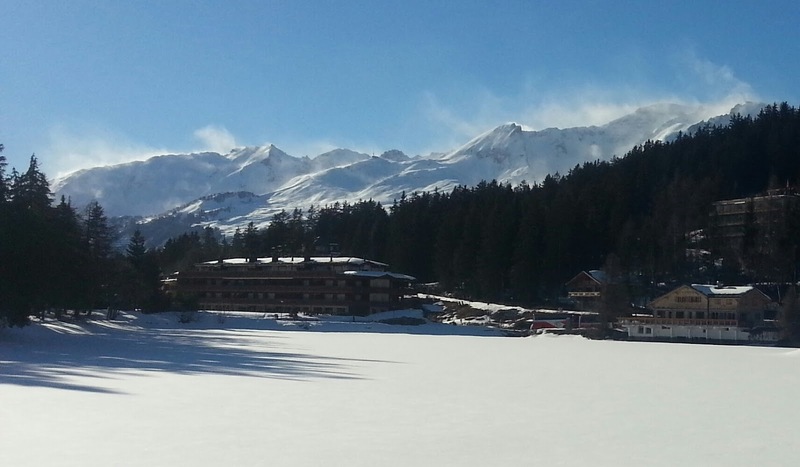 Just 5 lifts were running in the Crans-Montana ski area and by 1pm it was down to 3. Wind speeds of 115 km/hour were measured at the Violettes mid-station at 2200m. At times it felt like we were back skiing in Scotland with the icy blasts of spindrift, then I noticed there was snow under both skis and knew it couldn’t be Scotland! We finished skiing by 2pm, caught a bus back to our hotel in Montana, dropped off the skis and went for a 4 mile walk around Crans-Montana. The GPS said we had travelled 17 miles while skiing, including lifts. Here’s a couple of phone shots from our walk. The mountain one shows the spindrift being blown off the mountain tops. I didn’t carry my big Mamiya 7 camera the last 2 days so I left these as colour shots as there won’t be a black and white version! The forecast is good for tomorrow so it’s a proper photo day with my Mamiya 7 camera and tripod! Fingers crossed the lifts are open.